John Gibson Senior Director, International Tax and Transfer Pricing - comScore, Inc.
Mindy did a brilliant job summarizing issues related to Killer B transactions and telling the story of the IRS responses over the years. I think it is absolutely amazing how Amy turns the things we have to draw into readable prose. Jack has a special talent and fortunately is prolific in using it. 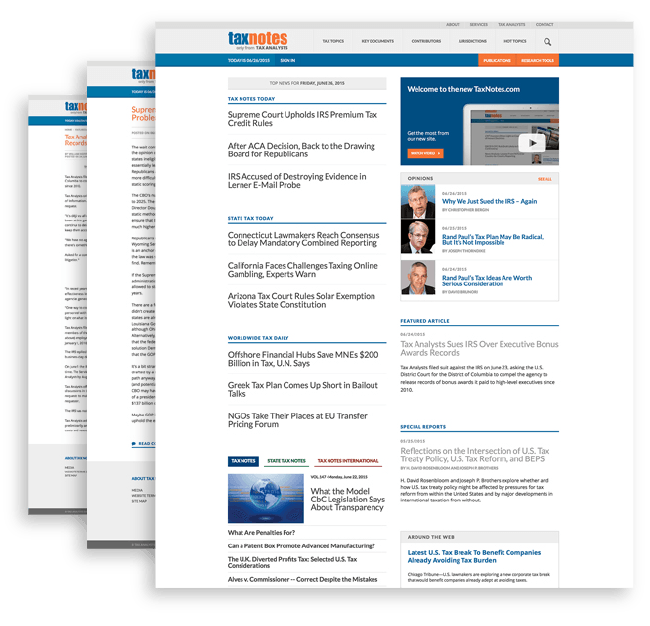 Tax Notes offers a wide-array of services, including federal, state, and international tax news, commentary, and analysis (available both online and in print), as well as select research tools. The easiest way to find out which services are best for you is to contact us by clicking here, calling (800) 955-2444, or emailing us at subscriptions@taxnotes.com. Tax Notes serves a wide variety of customers from many industries, including multi-national corporations, law firms from large to small, the big four and super-regional accounting firms, federal and state governments, nonprofit organizations, and universities and higher education.